All the runtime types are inherited from the QsValue reference type. These types has gone through a careful architecture to describe the sematics of the language elements. 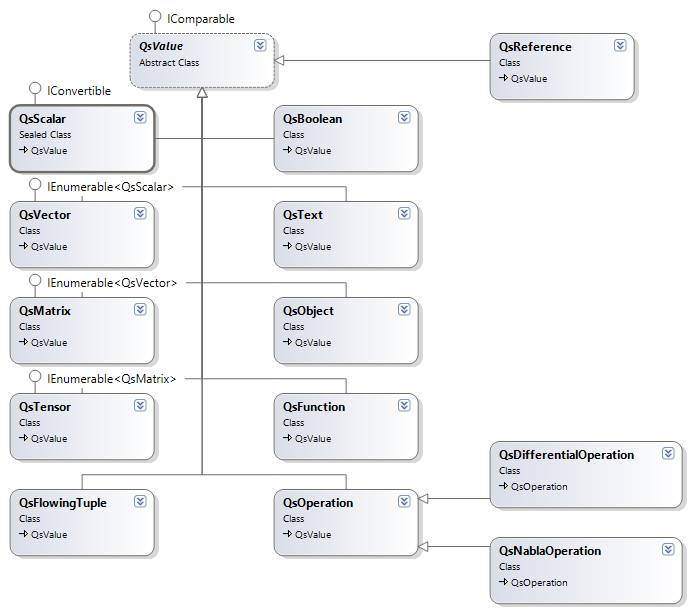 The following class diagram illustrate how these types are related to the QsValue . After this diagram a breif discussion for each type is illustrated for the reader to follow what the runtime is capable of. Mathematical Types are those types that shape the algebraic operations in the runtime. 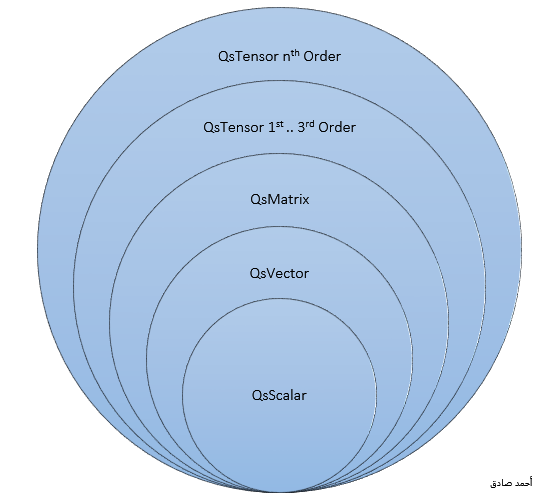 These mathematical types includes Scalars, Vectors, Matrices, and Tensors. The relation between these types can be show in the next figure. The explanation of these types comes in subsequent chapters. This is a True, and False values .. However this type was introduced recently in the runtime and most of comparison statements still use the System.Boolean type. Qs> name = "Ahmed Sadek"
Applying indexer to the QsText result in getting the text separated by lines. Special type for dealing with CLR objects. Qs> PR = "hello there"
The declaration of reference varaiable requires to preceded & similar to C++ references before the variable name. changing the reference value variable only changes the referenced value. This is a base class for currenlty two implemented operations Differential and Nabla Operations. The implemented operations are stored in the QsScalar class with an operation type that carried out during calculations to obtain specific techniques. This is the tuple implementation in the runtime. The tuple is declared with between two brackets with more than one value and can contain any of the types mentioned in here beside itself.